We wanted to share some great information about mini-split heat pumps that we received from Cape and Islands Self Reliance. At A3 Architects, we typically specify mini-split heat pumps (ducted and ductless units) for a majority of our projects. This all electric system provides heating and cooling and is two-to three times more efficient than electric resistance baseboard heating of the 1970s and 80s. When paired with solar photovoltaic panels on your roof, heating and cooling with electricity becomes an efficient and affordable option. Ductless mini-splits provide cooling, dehumidification and heating in the same unit, which typically hangs on the wall. The compressor is located outside. 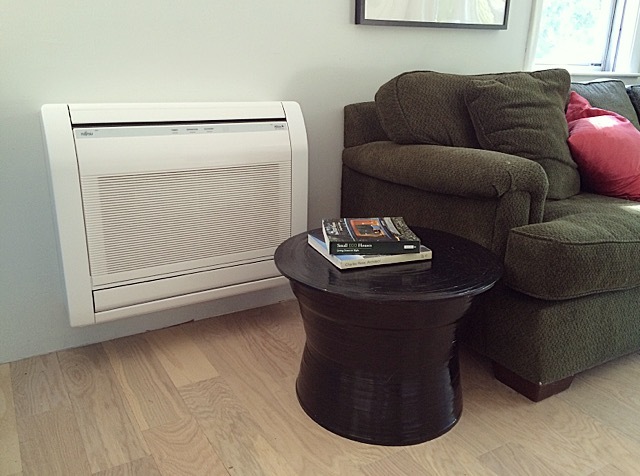 To cool, the unit moves the heat out of the building just the way an air conditioner does. When it gets cold and you want to get heat from the unit, it reverses to pull heat from the outside air and pump it back inside. Check out the great new incentive available through the MA Clean Energy Center (rebates up to $2,500) which include higher incentives for moderate income households and for replacing electric baseboard heating. These incentives can be coupled with the incentive from Mass Save (rebates up to $300 per inside unit). Mini-split units must be qualified, listed with and certified by the Air Conditioning, Heating, and Refrigeration Institute (AHRI), and meet the program SEER (Seasonal Energy Efficiency Ratio) and HSPF (Heating Seasonal Performance Factor) requirements. Self-Reliance recommends that you consider the Fujitsu models as they offer the highest performance ratings for heating and cooling while being very energy efficient. Ductless mini-splits are easy to have installed and are quieter and more efficient than window A/C units and much more efficient than electric baseboard heating. We have partnered with local installers who will do a free site assessment and provide you with a quote specific to your home or business. You can sign up here, or call our office at 508-563-6633 or email reliance@reliance.org. The above information was provided by Cape and Islands Self- Reliance. Self Reliance is a non-profit based in North Falmouth that promotes energy efficient and renewable energy technologies. Please visit their website to find out more about this organization and how you can benefit from their programs.